Practitioners are invited to attend this one-week study abroad course from June 23–30th. Curriculum will compare U.S. and Netherlands problems, priorities and solutions with specific emphasis on design and engineering principles. Leading bicycle professionals responsible for creating and maintaining the Netherlands' world-class bikeway system will teach the Dutch approach to bike and pedestrian planning and design through an intensive week of classroom sessions and tours. The instruction and interaction with other participants will bring you up to speed on innovative practice and research and teach you the skills and techniques you need to start incorporating Dutch principles into your next project, and adapting them for a North American context. Upon completion of the course, participants will be able to: Select the appropriate bicycle facility design based on urban form, traffic conditions and multimodal context Identify various options for treating intersections that incorporate bicycle facilities Network with international experts from the various facets of bikeway design Leverage land uses to better support active transportation Feel rejuvenated and excited to go back to work and make an impact! Monday, June 24 Morning Activity: Get bikes! Orientation & bike safety. Take a tour of the city and watch welcome presentations from the instructors. Transportation engineers, urban planners, advocates, policymakers, municipal staff and other transportation professionals interested in nurturing cycling in their communities. Participants must be able to bike up to 10 miles a day. The registration deadline is April 14, 2019. Registration is through Portland State University's Education Abroad. Contact us at asktrec@pdx.edu if you have any questions. Requests for reasonable accommodations are made through the registration process. 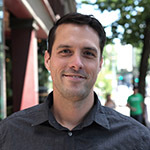 Nick Falbo, Senior Transportation Planner at the City of Portland, is an urban planner and designer specializing in bicycle and pedestrian transportation. He has a personal interest in visual communication for planning, as a way to tell stories, communicate new ideas, and open minds. He is also the creator of the Protected Intersections for Bicyclists video proposal for adapting Dutch intersection designs to US streets. Nick has been a lead instructor on the annual IBPI Bikeway Design summer workshop for many years. Additional instruction and support provided by John MacArthur and Aaron Golub of Portland State University.